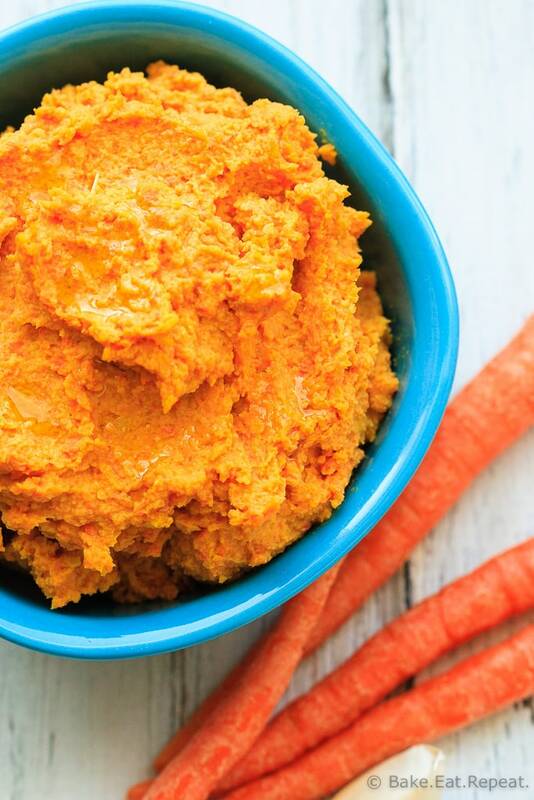 Roasted Vegetable Hummus Recipe - Bake. Eat. Repeat. 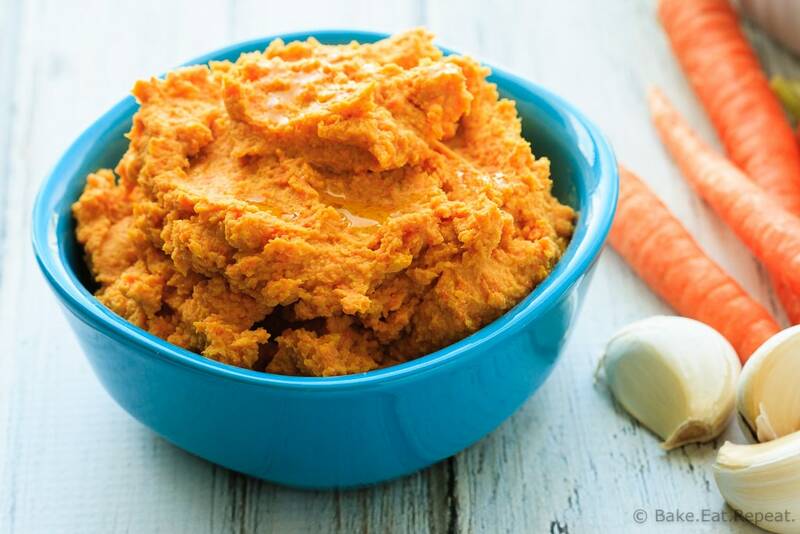 Roasted vegetable hummus filled with carrots, sweet potatoes, shallots and garlic – quick and easy to make and it makes a perfect healthy snack! Isn’t hummus the best snack? 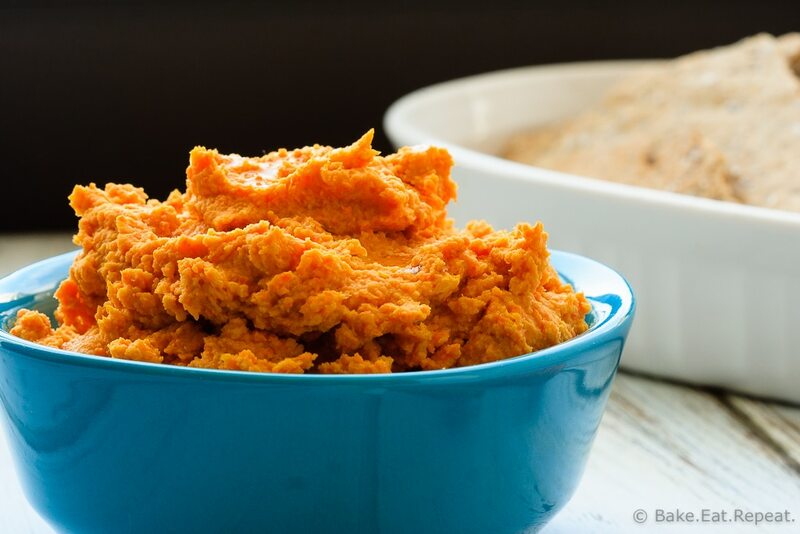 Anytime you can whip up a tasty dip in a matter of minutes it’s great, but hummus is also healthy. Plus it works well as a snack, as lunch, to throw into a sandwich, and there are so many flavour options! Doesn’t get much better then that. Plus, my veggie hating preschooler likes it. That, my friends, is my definition of the perfect snack. Vegetables my kid will happily eat for lunch. Something about dips – that kid just goes crazy for them. He’ll eat most things if there is dip involved. I’m kind of enjoying this character trait of his. My older two would never touch any kind of dip when they were younger. Hummus, ranch, cheesy dips, chip dip – didn’t matter, they wouldn’t touch it. Whenever there was something that they wouldn’t eat, the first tip you could find in helping with the pickiness was always “serve it with a dip”. Yeah….not helpful when your kid won’t eat dip! My youngest though – he loves dip of any kind – so now I understand that little what to do about your picky eater tip! And I can’t say I blame him. Dips of any kind are fantastic. And hummus is just the best of both worlds – a great dip but also healthy. Because let’s be honest, dip generally isn’t a healthy snack. Typically it’s loaded with cheese and sour cream and more cheese. Plus, there are so many combinations that can be made when it comes to hummus! This roasted vegetable hummus was actually a bit of a happy accident. Nice when that happens. Basically I had a lot of random vegetables in my fridge that needed to be used up so I roasted them and blended them up to make hummus. Because anytime I can make a dip out of vegetables, and then happily dip more vegetables into it and call it lunch (and convince the preschooler to do this as well)? That’s gold. I’ve also shared this Roasted Vegetable Hummus Recipe over on Food Fanatic. I don't blame your youngest for loving this dip...I wish I could dive right into this for breakfast! You are reminding me that it's been way too long since I've made hummus. I love this veggie version!